Every year between June and September, Ghangharia becomes a busy place. 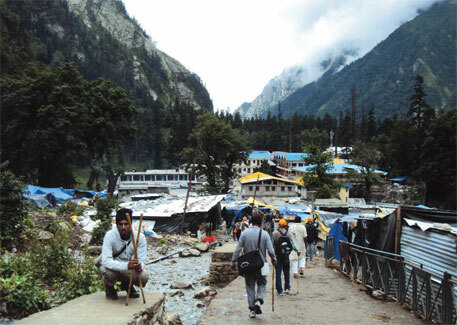 Pilgrims going to the nearby Hemkund Sahib gurudwara and those visiting Valley of Flowers, a World Heritage Site, have to spend at least one night in this small settlement in Uttarakhand’s Chamoli district. Residents have cashed in on the influx of tourists by opening hotels, restaurants and small shops. But they live in constant fear of losing their means of living. 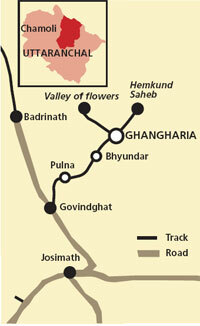 Ghangharia lies in a reserve forest and is part of the van panchayat of Bhyundar (see map). The van panchayat, which is responsible for managing forests along with the forest department, has been active in Ghangharia since 1965. Over the years, the community has been fighting with the forest department over land rights. The residents want some part of the forest to be earmarked exclusively for livelihood through tourism—to which the authorities have paid scant attention. The authorities maintain that the existing hotels, restaurants and shops are illegal since they have been built on forestland. Events in December 2011 underlined the increasing tension between the two. Forest officials cut down two trees of endangered Himalayan yew to build an additional hut for an information centre. Residents, who need to obtain a series of permissions from the forest department to cut even one tree, filed a complaint with the district magistrate, the divisional forest officer and the state and the Union Ministry of Environment and Forest (MoEF), saying the tree should be protected because it is home to an endangered bird (see ‘Proof at its best’). In a letter dated June 27, 2012, MoEF asked the sarpanch of the van panchayat to verify the residents’ claims. The sarpanch, Sanjay Rawat, through whom the complaint was filed, is yet to respond. When Down To Earth enquired about the tree felling, the forest department said it was necessary because the trees were growing in the middle of the construction area. “We can cut down trees for work related to protection and development of forests,” says S R Prajapati, the divisional forest officer. Madal Lal Sah, the local forest guard, adds the trees were small and unlikely to survive. “We will compensate by planting 10 similar trees in the region,” says Prajapati. Residents of Ghangharia claim the forest department is not protecting the forests. The officials cut down two Himalayan yews in December 2011 (Taxus wallichiana). Following this the residents filed a complaint with the authorities. As evidence, they sent a photograph of the trees before they were cut down. The photograph was taken by former gram pradhan Jagdish Chauhan. Himalayan yew or thuner, as it is locally called, is the winter home of the state bird "monal". The bird (Lophophorus impejanus) is protected under schedule 1 of the Indian Wildlife (Protection) Act of 1972. IUCN classifies the Himalayan yew as endangered. It is also included in the Red Data Book of Indian Plants and is part of the Convention on International Trade of endangered species of wild Fauna and Flora, restricting its trade. Regeneration of the tree is difficult as the seeds take two years to germinate and the tree grows slowly. 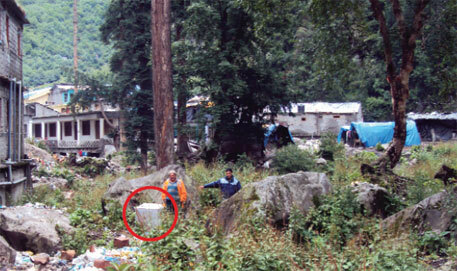 Traditional uses of the Himalayan yew do not put the tree at risk. People used to drink an infusion of the bark to keep the body warm in the coldest of winters. With the easy availability of tea in the market, only its fruits are now used. In the 1990s, 90 per cent of Himalayan yew trees were cut to derive an anticancer drug from the bark and leaves. Both Prajapati and Sah believe residents filed a complaint on such a trivial matter because a powerful faction of the Ghangharia community is in a legal tangle with the department. In November last year, the department had filed cases against five hotel owners in the district court for illegally extending their hotels. The owners, including gram pradhan Devendra Singh, claim the officials have arbitrarily marked the boundary for forestland. Still, the hotels are within limits, they add. The next hearing of the case is on August 10. Former sarpanch of the van panchayat Vijendra Singh Chauhan explains the boundary issue. Till the 1970s around 8,000 hectares (ha) was under the control of the van panchayat (land under van panchayats is revenue land). “But in the 1980s, the department took over 650 ha, saying the area was too big for us to control,” says Chauhan. At the time of land transfer, the department did not mark any boundaries. “In 2007, the officials haphazardly installed pillars to mark the limit. They did not even consult the van panchayat as required under law,” he adds. What’s more, the van panchayat has not been given a map that shows land under its jurisdiction. In April 2012, Rawat filed an RTI demanding the map. Reply is awaited. Ghangharia residents, who have been traditional grazers, say they have no other income source besides running hotels and restaurants. Under the Forest Rights Act (FRA), forest dwellers can use their land for agriculture, not tourism. In Uttarakhand, where FRA has not been implemented, agriculture is difficult because of rocky terrain and extreme weather conditions. Resident Raghubir Chauhan says his hotel is the only source of income for him. “If they take away this, I will have to leave my village and learn a new trade,” says Chauhan, who earns between Rs 2-Rs 8 lakh annually. Devendra Singh demands that 8 ha of forestland should be diverted for hotels. In 1960, the first construction on forestland started when the department leased out land to the Hemkund Sahib gurudwara. At present, there are 53 structures within the forestland, of which only 10 have leases. Singh alleges the gurudwara has been given preferential treatment over the local community. Others have backed the demand of the residents. 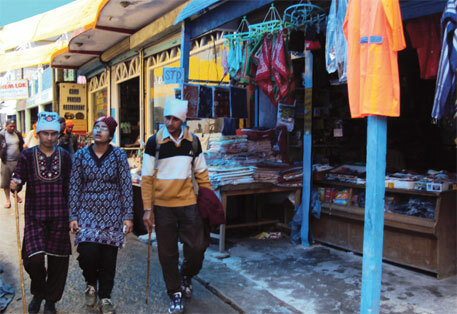 In 2005, Tata Consultancy Services Ltd, which was commissioned by the state tourism department to prepare a master plan for ecotourism in the Valley of Flowers-Hemkund belt, had recommended that land should be diverted to ensure residents’ land rights. Land conversion would imply diverting forestland under the Forest (Conservation) Act of 1980. The Act considers only those areas for conversion that the state had identified before the Act came into existence. In 2004, the revenue department along with the forest department created a database of the land on which construction has taken place in Ghangharia. They found that buildings had been constructed on 1.99 ha before 1980 and petitioned the nodal officer in Dehradun to convert it into revenue land for hotels. The authorities are yet to take a decision on the petition. In the absence of regularisation, buildings are growing stealthily in Ghangharia. By 2002, nearly 3 ha was occupied by hotels, shows a study by Tata Consultancy Services Ltd.
Officials say despite no response to the petition, all the 53 structures within the forestland have been allowed to stay. “As long as the resident community maintains a status quo, there is no problem,” says Prajapati. Rawat says there are many instances where the department has interfered in the smooth running of the settlement. The forest officials created hurdles in the van panchayat’s recent efforts to lop a few trees to make way for electricity transmission wires, says Rawat. The officials also do not allow any construction material because the department does not want any additional construction in the area. “While the department allowed a helipad in the area, it objected when the panchayat leased out land for setting up tourist tents,” adds Rawat. It seems the residents’ demand of revenue land for forests would remain unheeded. A July 2012 report of the Central environment and forests ministry on the action taken on all proposals from Uttarakhand for land conversion between 1980 and 2012 does not mention anything on hotels in Ghangharia. Among the approved proposals, 0.99 ha is for integrated development of Hemkund Sahib and Govindghat, 0.04 ha for a reporting police post and 1.3 ha for a path from Ghangaria to Hemkund. Forest right activists say instead of giving the land to outsiders for hotels, it is better to let the residents use it. “These people are the original residents of the area and should get land rights,” says Roma of National Forum of Forest People and Forest Workers. If the situation is not defused quickly, the future of community forestry would be at risk, says Hem Gairola, founder of the Himalayan Community Forestry Centre in Chamoli. “Van panchayats have worked well,” he adds. However, Gairola blames the changes in the van panchayat rules for the deterioration of working relationship between the forest department and the community. The first set of rules came out in 1931, since then it has been revised four times. “With each set of rules, the powers of the van panchayat have been diluted,” he says. For instance, before the rules were amended in 2005, the van panchayat could decide how it wanted the land to be used. “If the community wanted a part of the land for hotel construction, the van panchayat would have allowed it if necessary,” says Gairola. The government should work with the community and set down rules as per requirements, otherwise conflict would start in sensitive areas, he suggests. Guman Singh, coordinator of Himalaya Niti Abhiyan in Himachal Pradesh, suggests political involvement as a solution. Under existing laws, it would be easy to label the ongoing commercial activity in Ghangharia as encroachment. “The residents cannot now go back to traditional grazing activity and should be given land for alternative livelihood,” says Singh. The community needs to petition the government and appeal for its livelihood. “The fight over settlement of land rights is a national phenomenon. The resolution will come from this fight,” he says. Classic case of divergent priorities! The forest department seems to want to 'protect the forest', the community seems to have little stake in the protection, and the two will keep clashing. One wonders if tourism can ever be completely 'eco-friendly'? It will ultimately consume the very resource it was founded upon. 1. The other side of the coin is that locals need 'selective' development in this area suiting to their own income/profit generation instead of 'anything' else. 2. Road construction has always been opposed by locals to help benefit mule owners, hotel owners and porters. The impact is over 3,000 mules inhabit the area, creating nuisance, filth & public agony besides devastating natural beauty, overall aesthetics and the soil. One can check feedback of tourists in the register kept at EDC Govind Ghat's Office in this reference. 3. Govt. can construct lodges, restaurants and other boarding facilities for tourists on sustainable basis but it has always been opposed. The impact is skyrocketing prices of food & other basic commodities. But for locals it is immaterial because it helps improve their economy. 4. In less than 4 months of tourist season, locals makes huge money and profits to run over next season e.g., cost of a Rs.200/- room is about 2,000/- exploiting the average tourist, for it has just no other option [Demand vs price thing]. 5. Exploiting and finishing the natural resources in the name of providing employment, creating livelihood opportunities and helping locals has become a trend. e.g, All is not well in the Corbett TR. 6. Garnering local communities' support to help conserve natural resources and preserve forest rich areas vs. their greed will never serve the purpose, in spite of them being well 'aware'. To say that the tourist has more rights over the area than the community is a bit unfair. Unlike the tourist, the community has more reasons to protect the area. For example, the EDC is a non-profit run by the community. They spend most of their resources on cleaning up the plastic waste left by the tourist all along the track (http://www.downtoearth.org.in/content/redemption-litter). To protect the tourist from being fleeced, regulation of the existing hotels might be a good idea. There are finite rooms at Ghangharia and limiting the number of visitors seems to be a good solution. The only problem is that tourists might not like this rationing.